Required: Four No.12 needles. Two ounces of Alloa wheeling  or other suitable wool in a drab shade. Directions: Cast 16 stitches on to each of three needles making 48 in all. Knit 2 plain, 2 purl, until a ribbed cuff three inches deep is attained. Then knit all plain for another inch in length. Commence the thumb on the first needle. For this knit 2; make 1 by knitting into the loop of wool between the stitches; knit 2; make 1; continue knitting to the end of this first row. Knit two plain rows. On the first needle begin the fourth row; knit 2; make 1; knit four; make 1. Finish with plain knitting. Knit two plain rows. On the first needle begin the seventh row; knit 2; make 1; knit 6; make 1. Finish with plain knitting. Knit two plain rows. On the first needle begin the tenth row. Knit 2; make 1; knit 8; make 1. Finish with plain knitting. Knit two plain rows. On the first needle begin the thirteenth row. Knit 2; make 1; knit 10; make 1. Finish with plain knitting. Knit two plain rows. On the first needle begin the sixteenth row. Knit 2; make 1; knit 12; make 1. Finish with plain knitting. Knit two plain rows. On the first needle begin the nineteenth row. Knit 2; make 1; knit 14; make 1. Finish with plain knitting. Knit two plain rows. On the first needle begin the twenty-second row. Knit 2; make 1; knit 16; make 1. Finish with plain knitting. Knit two plain rows. On the first needle begin the twenty-fifth row. Knit 2; make 1; knit 18; make 1. Finish with plain knitting. Knit two plain rows. Take off the 18 stitches between the increasing stitches on a piece of wool and tie securely to prevent slipping. Knit around plainly, excluding these 18 stitches, until ½ inch in length is gained, then knit 2 plain, 2 purl, for another inch. Cast off very loosely. Take up the 18 stitches on three needles, 6 on each. Make 2 stitches at the inside of the thumb, giving eight stitches on the first needle. Knit plainly round for ½ inch, then 2 plain, 2 purl, for 1 inch. Cast off very loosely. 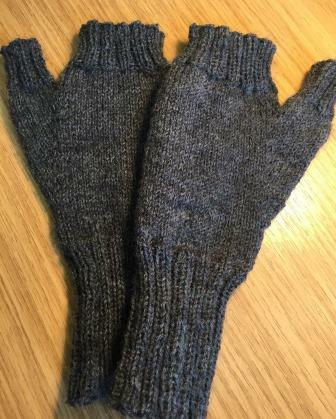 The mitten when finished should measure 8 inches long and 7 inches wide across the top. Metric size 2.75mm, US size 2.